US intelligence agencies have pointed toward the Russia Today television channel as part of an ongoing effort to prove the Kremlin conducted a pro-Trump “influence campaign” in the run-up to the presidential election. The long-awaited and recently declassified intelligence report into Russian influence in the election claimed that Russia’s “state-run propaganda machine” contributed to this influence campaign by serving as a platform for Kremlin messaging to both Russian and international audiences. 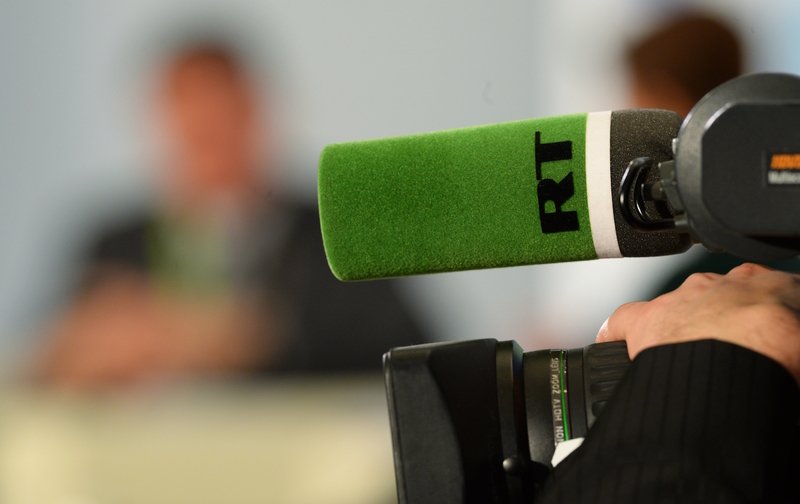 The report dedicated seven of its 25 pages to RT America—an offshoot from RT’s main Moscow-based international operation—which is funded by the Russian government. But it’s not just intelligence agencies characterizing RT America as a vehicle for pro-Trump messaging. The accusation has become a common theme across traditional US media outlets as anti-Russia hawks and both liberal and conservative analysts seek to discredit anyone who strays from the accepted narrative on RT as a Kremlin stooge. Larry King, one of America’s best-known interviewers, who now hosts Politicking on RT America, interviewed Trump himself. After introducing the then–GOP nominee as a “good friend,” King proceeded to push back against Trump on a number of issues, including his “secret plan” to defeat ISIS. Ed Schultz, who hosts News with Ed Schultz, also routinely ran segments that criticized Trump. “Who’s gonna stop Donald Trump! ?” pleaded Schultz before a segment on how the GOP was worried about the reality-TV star’s unstoppable rise. Schultz also aired an interview with Bernie Sanders, who lambasted Trump’s bigotry and sexism and called Clinton “far and away the superior candidate”. RT America has also critically covered Trump’s plans to “load up Guantánamo” with “bad dudes,” run negative segments on his personal taxes, reported on Latinos fearing deportation of friends and family, criticized his joke about assassinating Hillary Clinton, covered controversy around his choice of Steve Bannon as chief strategist and run segments calling both his health-care and foreign-policy plans lacking in detail. It would be hard to describe any of this as Trump promotion. If RT can be accused of trying to influence the American public, it certainly was not by feeding them a steady diet of pro-Trump information. It would be fairer to say RT tried to influence its viewers by airing coverage consistently critical of the American democratic system and process in general—and unfortunately for US intelligence agencies—there is no crime in that. If RT’s critical reporting on the United States is factual—and not even the intelligence report is claiming that it isn’t—then it’s no different to any other channel with an editorial slant, albeit one with far less influence on the American public than mainstream US channels. The disparagement of RT as a Vladimir Putin–controlled engine for pro-Trump propaganda boils down to anger over the fact that the American journalists who work for RT have the audacity to shine a light on unflattering aspects of the American political system. What’s more, it’s completely illogical to think that RT, which reaches only 1 million American viewers a day, could have had a hand in electing Trump. Are these intelligence officials and columnists really suggesting that RT America had more insidious and nefarious pro-Trump influence on American voters, than say, Sean Hannity on Fox News? It’s unlikely that even RT would believe it could hold such sway. Danielle RyanTwitterDanielle Ryan is an Irish freelance journalist and media analyst. She has a column at Russia Today.